Advancing research & scholarship in the stem cell field while staying committed to a deep-rooted Catholic identity. The Center for Stem Cells and Regenerative Medicine at the University of Notre Dame is an interdisciplinary enterprise, bringing together biologists, biomolecular engineers, lawyers, philosophers, and theologians to advance the research and application of adult stem cells and induced pluripotent stem (iPS) cells in a wide variety of organisms, while also stimulating the ethical and legal discussion associated with stem cells and their use. 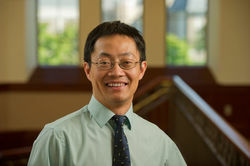 Siyuan Zhang, the Dee Associate Professor of Biological Sciences who is also affiliated with the Center for Stem Cells and Regenerative Medicine and the Harper Cancer Research Institute, landed a nearly $1.1 million Breast Cancer Research Program Breakthrough Award through the Department of Defense in August. The Ravosa lab is studying evolutionary morphology, mechanobiology, development, aging and pathobiology of the vertebrate skull, feeding apparatus, and musculoskeletal system. Learn more about the research taking place in the Ravosa Lab. Former undergraduate researchers in the Center for Stem Cells and Regenerative Medicine at Notre Dame describe a little about their experience and how it impacted their decision to pursue a doctoral degree.